Where custom upholstery workmanship is still an art. With over 60 years experience we specialize in Traditional, Antique, Modern and Custom Upholstery. We are a full service, custom upholstery and design company that specializes in creating custom-designed furniture and providing reupholstery services for antique furniture pieces. Whatever you have in mind, we’ll create it for you, giving you a one-of-a-kind piece of furniture to enjoy for many years. We repair all types of upholstery problems using the highest quality materials. When we reupholster or restore your furniture, our reputable team will put their extensive knowledge base to work for you. Our level of experience sets up apart from our competitors as evidenced by our strong referral business. Retail Furniture – purchase pieces to be custom upholstered for you! fabrics, vinyl, leather, foams, glue and adhesives, zippers, cording, padding, and more! Contact us for a Free Estimate any of your upholstering needs, big or small! 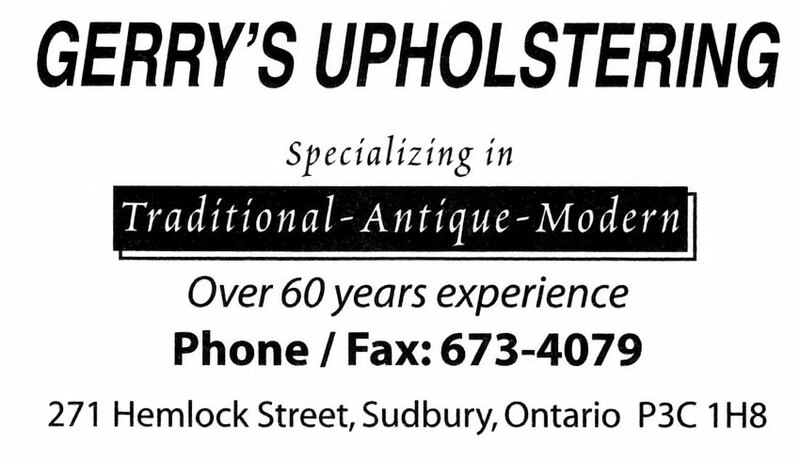 Gerry’s Upholstering, Upholsterers, Upholstery Fabric, Boat Covers, Upholstery & Tops, Leather Goods Repair in Sudbury Ontario.